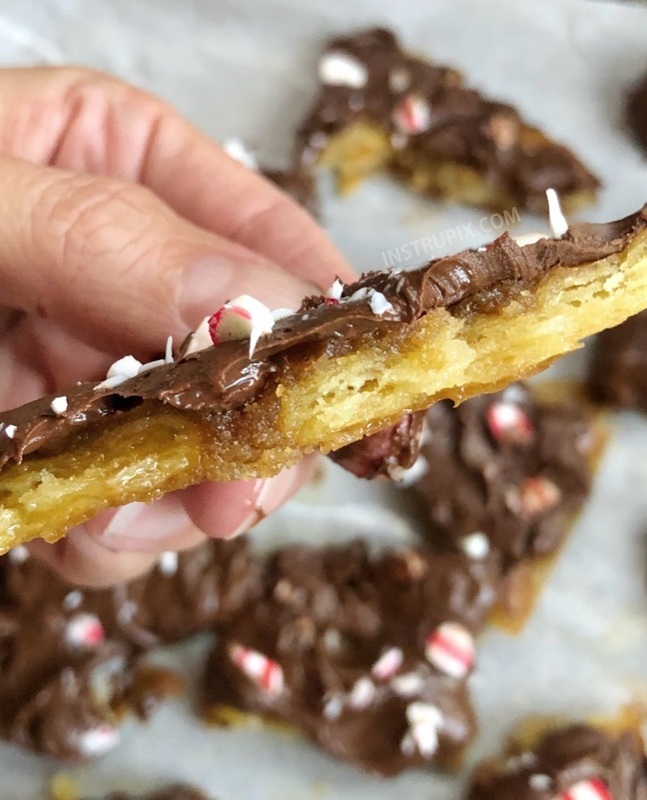 How To Eat “Christmas Crack” . . . All by yourself – People Will Steal It! “Christmas Crack” SHHHhhhh . . .
Preheat your oven to 425 degrees and line an 8×8 baking dish with parchment paper. Cover the bottom of the pan with Ritz crackers. It doesn’t have to be pretty! Just fit them in there in a single layer as best you can. Combine the brown sugar and butter in a pan and bring to a boil. Boil for 3 minutes WITHOUT stirring. Immediately pour the mixture over the Ritz crackers in your pan. Use a spatula to spread it out evenly over the crackers. Bake for 5 minutes to thicken and set the caramel. Remove from the oven, and then sprinkle the chocolate chips evenly over the top. Place the pan back in the oven for about 2 minutes or until he chocolate is soft enough to spread. Immediately spread the melted chocolate chips with a spatula so that you have a nice even layer. Top with the candy of your choice (optional). My favorite is crushed peppermint candy! You can also try topping it with M&Ms, nuts, sprinkles, etc. Let it cool for several hours before removing it from the pan and breaking it apart, otherwise it’s a bit of a mess! I couldn’t wait to dig in this time and the chocolate was still runny. Feel free to place it in the fridge for a bit if you need to speed up the process. Previous PostPrevious How To Add Luxury To The Basis . . .
Next PostNext Start The Day With A Laugh . . . Good Food For The Soul!